LOS ANGELES, Calif. /California Newswire/ — To celebrate the release of iPhone X and Halloween, iMobie Inc., a leading software developer, rolls out the biggest sale promotion: buy the ultimate iPhone manager AnyTrans, get iOS data recovery PhoneRescue for FREE. On this Halloween, iMobie prepared AnyTrans to help iOS users take full control of the new iPhone X effortlessly. With it, users can easily migrate everything, including messages, contacts, photos, etc. to new iPhone X in just 1 tap, even selectively export Halloween tricks memories and more to computer for backup. 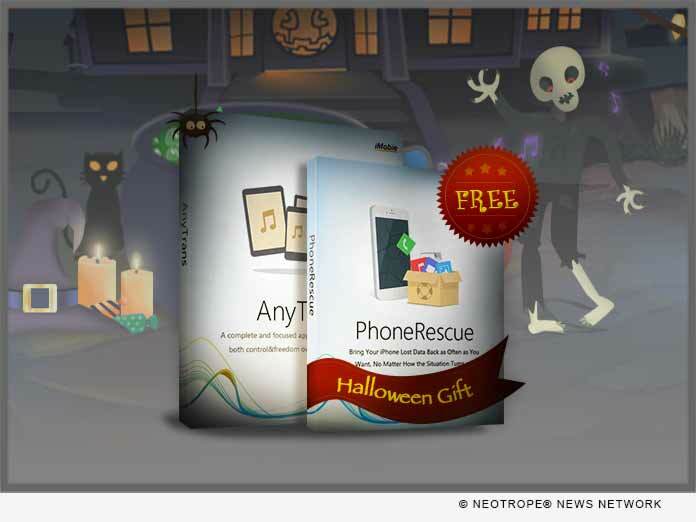 Better yet, the FREE Halloween gift – PhoneRescue, helps retrieve any lost iOS data and fix iOS system crashes if users meet problems when updating to iOS 11. This Halloween offer opens from Oct. 30th 2017 to Nov. 6th 2017, worldwide available. As an all-in-one iPhone manager, AnyTrans gets ready to help you make the most of iPhone X now and then. No limits, now you can move all data & files, including photos, messages, contacts and more from your old iPhone directly to iPhone X in 1 click. What’s better, it also helps you export all/selected what you need to computer for backup. More surprisingly, soon AnyTrans will get a big update to manage your data on iPhone, iPad, with a safer and easier way ever. And if you are a buyer of AnyTrans, you are totally FREE to enjoy all the upcoming features. With the bonus FREE gift – PhoneRescue, you’re now can easily and effortlessly restore lost-but-valued data on your iPhone iPad if you met data loss disasters after updating iOS 11. More than iOS data recovery, it also enables you to fix any iOS system crashes when rushes to iOS 11, including stuck on white Apple logo, continuous reboot loop, black screen, etc.